My biggest loves prior to comics were mythology and medieval knights. So unlike Spider-Man, where you had to understand the conflict of Peter Parker's responsibility, or Superman, where you had to understand why a strange visitor from another planet took up the never-ending battle instead of trying to rule us like every other alien seemed want to do, Wonder Woman I already knew. I had read about the Amazons, Zeus and Hades. Discovering the first of those three had sent an envoy to the modern world to impart their ideals, not only seemed like my books had criminally missed real mythology's grandest chapter, it made perfect sense, as if from Athena herself. This feeling that I already knew Wonder Woman, put her ahead from the start, and in the years since, no other female hero has ever caught up. This is in large part due to the fact Diana separates herself from her contemporaries by leading with her mind over her fists. Her in-panel beliefs are life lessons you can actually take away with you, putting them into play, long after the 'issue' has closed. Sure every post-Oprah super-hero does that these days, but none do it like the global icon where those beliefs are fundamentally built into her conception. Wonder Woman is not just a 'League of One', she is the heart of billions, the wisdom of the just, and the conviction to see truth prevail. The tired cliche 'Why does the messenger of peace bring war?' always makes my eyes roll more than dials on a Las Vegas slot machine. Once you're over the age of four, you soon come face to face with an immoral, unjust or victimised circumstance in life. Somewhere, where in amongst fear, red-tape, manipulation and self-depreciation, there is a universal need for a higher power to step in and lead with rationale and reason. A place where law has no jurisdiction, and needs someone prepared to slam their fists into the ground, if needed in order for the right resolution to be heard. That is where we 'escape' to the idea of Diana. 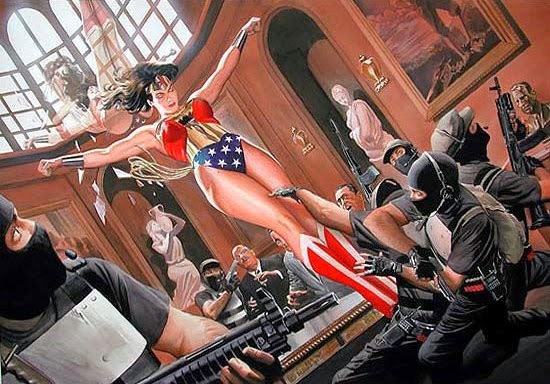 Wonder Woman never raises her fists in punishment or revenge, she raises them in education of the truth. It just so happens that at as 'that' higher power, she fights minotaurs and Ares in her spare time. 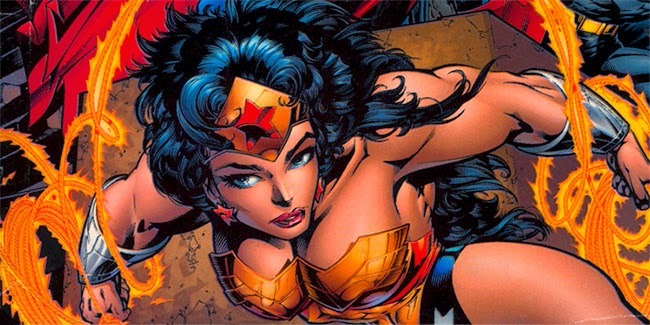 This week on IADW, will be Wonder Woman Week. The first in a series of planned character centric weeks every three months. While not every post will be dedicated to her amazing ways, there will be enough to show you that while she may not always be treated like the icon she is, an icon she always will be. I hope you like what is ahead. WW has always been my favourite solo superhero - you can keep Spidey and Hulk and Batman, but the lovely Princess Diana has always held a special place in my heart. I think that after FF she was the next comic I collected from a very early age. She has suffered from far too many revisionist reboots over the past several years but its the characters innate ability to constantly reinvent herself that enables her to keep solid ground amongst all the various societal changes we've undergone. She's kept her morals above all else and that's why I love her! Im preparing a massive article on her for later on this week [hopefully it'll be finished in time] about my admiration for her and her abilities. how ironic it just so happens i was watching an original episode of WW last night with my girlfriend on some retro TV net work. Nice Dave - at least it screens at a decent time there. Here it screens on the retro channel 'Jones', along with Hulk, Mission Impossible etc, but always either during the work day or late at night!